Were you able to guess the place and year of today’s Flashback photo? 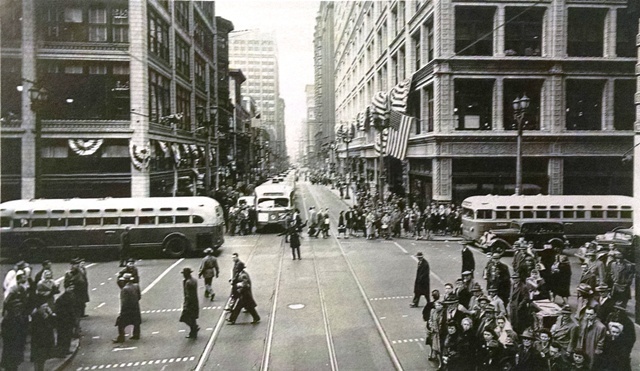 You are looking at a streetcar (middle) heading a line of eastbound cars on Olive at Sixth Street on Feb. 22, 1947. The old Famous and Barr store is on the right. Olive at 6th Street, 1945? Olive at Sixth street looking west is correct. Probably a 10 DELMAR or 11 UNIVERSITY streetcar coming at you. The buses are probably 21 TOWER GROVE, or 105 GRAVOIS, or 92 LINDENWOOD. Famous and Barr, department store, on the right far corner in the Railway Exchange Building.